John Eynon, deputy managing director for Persimmon Homes North East. Lynn Lucas and Lynn Lucas from The Chris Lucas Trust and Debbie Zaben, sales and marketing director for Persimmon Homes North East. A cancer charity has received a cash boost thanks to a national building company. Wallsend-based The Chris Lucas Trust has received £1,000 from Persimmon Homes North East for new office equipment and stationery. 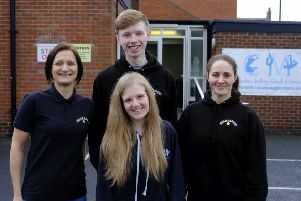 The charity was set up following the death of Chris Lucas, 18, from Hadrian Park, in 2000, having being diagnosed with Rhabdomyosarcoma, a rare form of cancer. The donation comes as part of the housebuilder’s Community Champions scheme, which will see a pot of £24,000 given out to local good causes over the next 12 months throughout the region. John added: “The quality of the submissions we received were very high, so choosing the good causes to support was much harder than we expected. “We now want to hear from more groups and charities as we look to allocate more funding over the next month.